writer Susan Kraus now tries to spend 2-6 months of the year in places closer to oceans, preferably where the locals speak a different language. In the last few years she has tracked penguins off the Chilean coast, zip-lined down a remote volcano (never again), danced in the streets of Ghent during their Flikken Festival and got carried away by a Fasching parade in Schweinfurt, Germany. She spent two weeks "In Search of the Perfect Waffle" in Belgium, swam with wild dolphins off Oahu, explored the Pine Ridge Reservation in South Dakota and got naked with strangers in Baden-Baden. She did language school in Tlaquepaque... and then there was that incident with the bear in Denali. And if you've never heard of the Praia-fest on Terceira, a volcanic island in the Azores, where locals taunt bulls in village streets with umbrellas for summer entertainment... well, she has a few stories you might enjoy. The Henry and Vera Bradshaw Memorial Award (2009) Top Writing Award. "Touched By Time." The Henry and Vera Bradshaw Memorial Award (2008) Top Writing Award. "Paris Without the Jet-Lag Steals Her Heart." 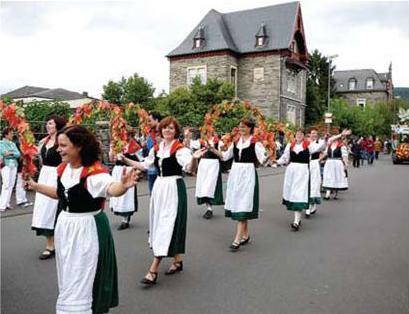 1st Place: Best Newspaper Article on Foreign TravelÂ (2009) "Touched By Time"
Villagers parade in traditional clothing at the wine festival of Bernkastel-Kues, Germany. as a naÃ¯ve 16 year old exchange student in El Salvador, followed by a stint as an au pair in Paris, and a summer trekking Europe alone with a backpack and rail pass. Then "real life" intervened: graduate school, her work as a therapist and mediator, marriage, kids, teaching at a university, developing a clinical private practice â€¦ yet always finding any excuse for a road trip. A book reviewer for many years, she started travel writing 19 years ago with a focus on family travel, as well as turning out a weekly regional travel column for three years for the Sunday edition of the K.C. Star. Her book, "A Game Day Guide to Towns of the Big 12," was the first guidebook organized around the cities of a major university athletic conference, a result of her affection for college towns. She was an on-line columnist for www.boomergirl.com, while expanding her writing to include international travel. She is particularly interested in the psychology of travel, solo travel for women, and making the most of travel after 60. Susan is a dynamic and engaging speaker in small workshop formats as well as regional and national conferences.